Today, virtual worlds abound, avatars are every day occurrences, and video games are yesterday’s news. But today’s games are not just a pastime for millions – they are also a technological focal point for new forms of learning. James Paul Gee and Elisabeth Hayes are leading researchers in the field of gaming, and here they argue that women gamers—a group too often marginalized—are at the forefront of today’s online learning world. By utilizing the tools of gaming in ways never before imagined - actively engaging in game design, writing fan fiction, and organizing themselves into collaborative learning communities - women of all ages acquire the tools to successfully navigate the complex social, cultural , and economic problems of the 21st century. Women are leading the way to a new understanding of online learning techniques, from cultural production to learning communities to technical proficiency in the latest software. 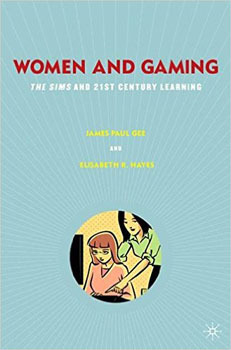 This book draws on case studies about women who “play” the Sims, the best selling game in history, to argue for a new general theory of learning for the 21st Century.